Buffalo is moving to make itself more bicycle friendly with the installation of more than 100 newly made bike racks throughout the city. 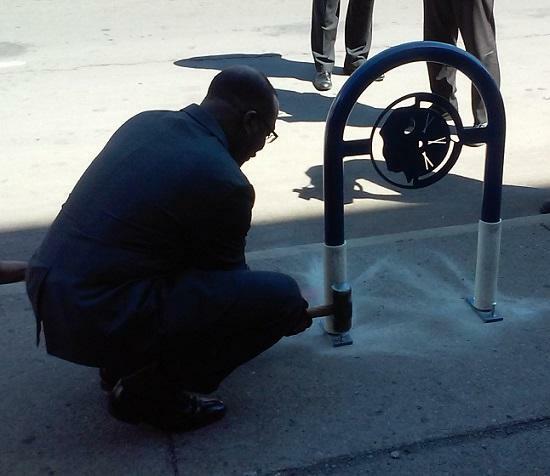 In all, 110 new blue bicycle racks will be set up in business districts throughout Buffalo. They sport the logo of GObike Buffalo, a bicycle advocacy group, which worked in partnership with local company Quackenbush Co., the City of Buffalo and local welder Sarah Fonzi to produce the units. Click here to listen to Michael Mroziak's radio report. Buffalo Mayor Byron Brown drives a bolt into the sidewalk to secure a new bike rack in front of the St. Vincent de Paul Society on Main Street Thursday. Advocates say more people, especially now as Buffalo heads into the warm weather months, are using bicycles to commute to work and get around the city. They believe by not spending dollars at the gas pump, bicyclists could play an important part in Buffalo's revitalization. "It's not just about health and the environment. It's also about the economy," said GObike Buffalo executive director Justin Booth. "People are choosing to live in cities where they bill a quality of life, and bicycling is a significant part of that. Bicycling also adds a significant piece to making and building more sales tax revenue in our city by getting more people out there that have more money to spend at local businesses." Two of the new racks were installed during a ceremony Thursday in front of the St. Vincent de Paul Society's facility on Main Street at Bryant. The executive director there, Mark Zirnheld, says the Society has been waiting two years for these bike racks. "A lot of the folks that we deal with, that come here to shop and that we serve, don't have access to cars," Zirnheld said. "We're thrilled to have mass transit available to us, but many of the folks we're dealing with rely on bicycles." The racks were forged in Fonzi's workshop at the Foundry, located on Northampton Street. The assembly process also served as an educational opportunity for the youths from Baker Victory Services with whom Fonzi worked. "These kids got to experience the welding and putting together all these bike racks," Fonzi said. "Now we have a few of them installed in front of our building. So they actually got to see the process, from beginning to end, and get to appreciate these bike racks out in front of the building and throughout the city." Along with increased bike racks, the City of Buffalo is looking to expand its network of bike lanes. It's expected that network of lanes will exceed 80 miles citywide by the end of 2015. "We have a lot of young people that are attracted to Buffalo because of things like our bicycle lanes, things like what we're doing to be bicycle friendly," said Buffalo Mayor Byron Brown. The city earned recognition by the League of American Cyclists with its bronze level status two years ago. "We continue to make the city more bicycle-friendly," said Booth. "In the last decade alone, since the city's been investing in making itself more bike friendly, we've seen over a 260 percent increase of the amount of people commuting to work by bike, and this continues to grow." Buffalo's commissioner for Public Works, Parks and Streets, Steve Stepniak, encouraged businesses interested in having bike racks to get in touch with his department. "If there's any questions about how you get on a list, to get a bike rack in front of your facility or business, call 311. That's how we've been generating those lists," Stepniak said. "We'll accommodate as funding becomes available."